At Springfield House Bed & Breakfast, you can be assured of a warm welcome and enjoy a real homely holiday. Here you will always find a friendly atmosphere with a high standard of accommodation. Guests are given the highest service from the moment of arrival and literally nothing is too much trouble. They have a great reputation for hospitality where fresh farm produce and home cooking is a speciality. Sprigfield House B&B is located in a peaceful, country area – on a dairy farm – surrounded by nature’s beauty and a panoramic view of the Atlantic Ocean. Located in the village of Rathbarry – a Tidy Towns Award winning Village. 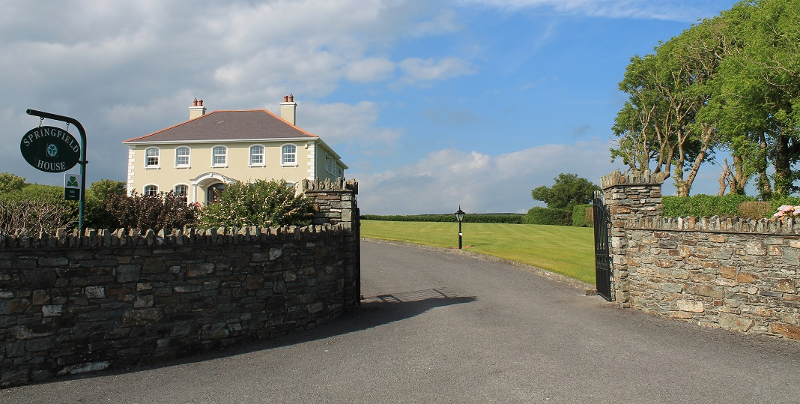 It is easily accessible from all main roads including the Clonakilty-Rosscarbery-Skibbereen N71 Road and is ideally located for touring West Cork and Kerry. Animal Farm: A very popular attraction at Springfield House is the so called “country experience” and you definitely get that when you stay here. On the farm they have – cows, calves, bulls & sheep. Guests are welcome to see these animals with Maureen as your ‘tour-guide’. – West Cork Fuchsia branded.